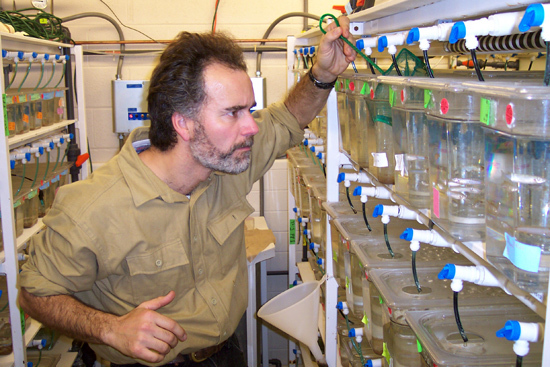 Stephen Devoto, associate professor of biology, neuroscience and behavior, studies vertebrate developmental patterns in zebrafish. A tiny fish popular with aquarium enthusiasts is poised to make a big splash in our understanding of muscle development. The results could have implications on the comprehension and perhaps treatment of muscular dystrophy, certain types of heart disease and other serious muscle-based ailments. These findings by Stephen Devoto, associate professor of associate professor of biology, neuroscience and behavior were recently published in the paper titled Generality of vertebrate developmental patterns: evidence for a dermomyotome in fish,” in the January issue of the scientific journal Evolution & Development. 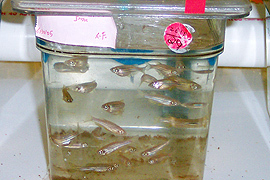 Devotos research examined the musculature of the tiny zebrafish, an aquarium favorite indigenous to South Asian streams. What the researcher found was that although fish and human beings comprise widely different physical forms, their underlying muscular development is much more similar than scientists had previously believed. In basic terms, Devotos work compared the cell layer that contributes to muscle formation in many different vertebrate species, including zebrafish, trout, skates and chickens, among others. He demonstrated that this cell layer in fish, know as the dermomyotome evolved prior to the last common ancestor of all vertebrates. But such moments are rare and often require tremendous amounts of work in and out of the lab. In Devotos case, the journey actually took him to Europe. While on sabbatical at Kings College in London during 2004, Devoto engaged in many lengthy talks with Simon Hughes who was Devoto’s host. Hughes, who provided Devoto with laboratory access during his stay in London, is also a fellow co-author, about chicken and frog muscle development. Our conversations planted the initial seeds that maybe muscle in all vertebrates is formed the same way, Devoto says. Their ideas were solidified after Devoto reviewed a cross section of trout embryos with Walter Stoiber, another co-author, at the University of Salzburg in Austria. Surprisingly, these connections had not been demonstrated before, Devoto says. After returning to Wesleyan in the summer of 2004, he threw himself into researching the early muscle cell development in as many fish species as he could find. Katherine Wolfe, an Olin Library assistant in the Interlibrary Loan Department, helped Devoto obtain copies of obscure hand-drawings and research from the 1800 and 1900s. Often he had to do his own translations of the German and French citations. I got so excited when I found out one of the journals was in I couldnt wait to analyze it, Devoto says. It turned out that some nineteenth century scientists doing comparative embryology suspected these similarities, but they did not have the ability to provide conclusive evidence back then. After analyzing their findings, Devoto and co-authors began writing the paper in the fall of 2004. Devoto and his team continues their research with zebrafish. The tiny fish are a transparent species that is easy to study and breed. Currently, about 5,000 of the fish reside in his laboratory. One of Devotos ongoing projects examines their skeletal muscle signaling protein, named Hedgehog. He and his colleagues learned that, when the protein is intentionally blocked in zebrafish, muscle development is disrupted. With his new work demonstrating close similarities between fish and humans in muscle development, Devoto believes that it is very likely that Hedgehog signaling is required for muscle development in humans. Anomalies in this signaling may underlie some muscle diseases such as muscular dystrophy and certain types of heart disease. Devoto and his undergraduate and graduate students are also trying to find out what happens next to the embryonic zebrafish muscle cells after they form.